Hey, just one of the many perks of working for Jacketta Sweeping! Hoping to make some extra money, Neil Jacketta began working part-time for a man who had his own sweeping business. Neil hadn’t been working too long when the owner died and his family had no interest in keeping the business going. So Neil bought a ride-on sweeper and started his own business in 1968. The first three years, the business was part-time, but then it became a full time job. Jacketta Sweeping Service did business out of the Jacketta family home. “My Mom, Bonnie, did all the bookwork,” said Debbie, current owner and daughter of Neil and Bonnie. It was easy to figure out which house the Jacketta’s lived in – just look for the driveway with the sweepers parked in it! It was a good thing Debbie was paying attention and getting involved in the business over the years because in 1999 her father died unexpectedly. “He was only 63 so it was a big shock.” Working through that loss and keeping the business performing was tough. However, after a few years Debbie decided to buy it. Debbie’s husband also joined her in the business. Craig’s mechanical experience working at a welding supply house made him a good fit for managing the shop and equipment. Currently two of Debbie’s three children are part of the company. Her daughter, Kara Moore, went away to college and a career, then came back and has been working at Jacketta Sweeping since 2015. Debbie’s son, Jarred Moore, joined the business in September 2018. Jarred started full time after working at the family business off and on during his college years and in between deployments with the military and work in government contracting. Many businesses are having a difficult time finding qualified workers and Jacketta Sweeping is no different. It’s not easy finding people who will stay for any length of time. Small companies often cannot provide benefits and sweeping equipment is so expensive; also the nature of the business is being on call 24/7, so it can be difficult. With Debbie’s children coming into the business, they may be able to streamline some issues using today’s technology. Of course, Debbie is super proud of all three of her children and in her own right has garnered many awards and served on several boards. 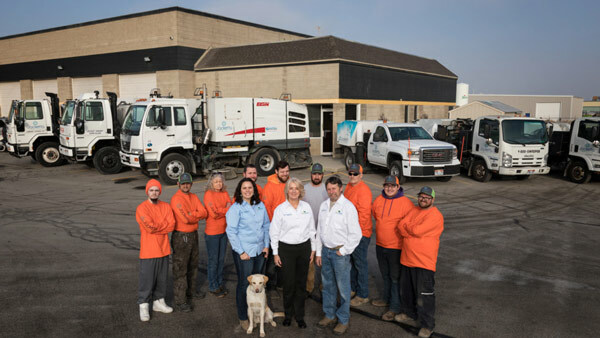 In 2018, the company was named Sweeper of the Year by Pavement Maintenance during the National Pavement Expo. 2008 Awarded the highly regarded Utah Business Magazine’s “30 Women to Watch” for her leadership of Jacketta Sweeping Service. Jacketta Sweeping has a core group of drivers that Debbie can always count on to show up and do a great job. The company owns 5 broom trucks, 2 vacuum sweepers, 6 lot sweepers, and 1 ride-on sweeper. Some of the more updated software they’re using is GPS to know where drivers are at all times, security cameras, and back-up cameras. Fifty years in business provides a great deal of experience but you also have to be willing to change with the times and give customers what they want and need. Jacketta Sweeping is doing a great job at that! With a 3rd generation of family in the business, it could be that one day, Jacketta Sweeping will celebrate 75 years of sweeping success!